Sri Venkateshwar International School wore its best garb on Saturday, the 28th of July, beating the sultry heat into oblivion with its resplendent layout, as the students and staff put up their annual exhibition – ‘Visible We’. 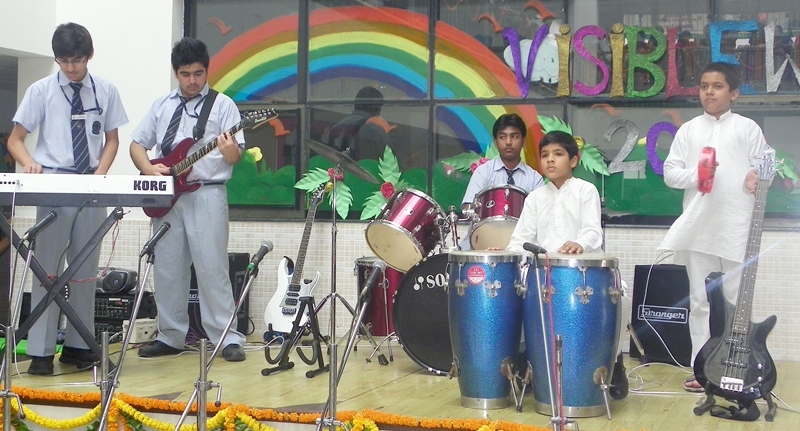 The exhibition mirrored the unending efforts of the students and staff to showcase the Project Work, International School Award, Green School Project Work and holiday homework of the students, along with a cultural programme enthralling one and all with enchanting music and dance performances. Every classroom was decked up according to a given theme and had a unique look. The students were dressed up appropriately and were eager to give a livid description of each of the displays. Class 2 rooms showcased culture and features of different countries of the world.The various sections of Class 3 projected the inspirational theme – ‘Go Green’ to sensitize the student and parent community about the need to conserve our natural resources and save the environment. Every aspect of the Go Green initiative, from organic farming to making newspaper bags was ardently displayed by the students. Besides this, they endeavored to strengthen the international bond by depicting the variedcultures of the different ISA countries. Classes 4 and 5 chose to adorn their classrooms subject wise. The splendid array of handmade projects, rich with information, was a sight worth beholding! There were interactive games and quizzes to involve the parents and visitors. The colourful atmosphere reverberated with a sense of pride and a zing of booming confidence levels. Every bit of effort paid off rich dividends when the Principal Ms Nita Arora , Primary Coordinator, Ms. Malini Pandey patted the backs and the parents applauded sweat and toil put in by the students.This creative effort added a feather of achievement in every student’s portfolio motivating them further and confirming their belief in their own work! Chairman of the school Mr. Sailander Solanki presided as the Chief Guest. Ms Pallavi Singh , a research scholar and faculty from The Management School, University of Sheffield, UK, Mr. Wahid from Mitra School of International Languages and Ms Samiksha from Sulabh International were the Guests of Honour. Match fixing – that’s not cricket!